"Come Into My Parlour: An Evening of Victorian Ghost Stories" opens tomorrow night, Tuesday, October 25th, at 8pm at the Newman Wine Vaults, 436 Water Street. Tickets are $15 per person. Seating is limited. Friday, October 28th - 4 tickets! Advance tickets (CASH SALE ONLY!) are available at Britannia Teas and Gifts, 199 Water Street, and will be on sale until 6pm before show time. If tickets are left, they will also be available at the door, but some nights may sell out in advance, so buy yours now to avoid showing up the night of the show and being disappointed. You are welcome to come in Victorian, Gothic, or Steampunk attire! 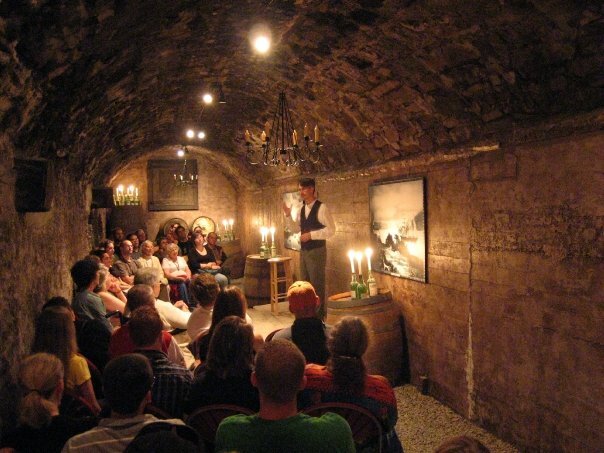 Come join me, storyteller and author Dale Jarvis, for an evening of Victorian ghost stories, perfect to get you into a suitably macabre mood for Hallowe'en! The show will be about an hour long, by candlelight! Tickets are now available at Britannia Teas and Gifts, 199 Water Street, St. John's. Tickets are $15 each, first come, first served, CASH SALE ONLY! HFNL and The Rooms kick off the Tales of Town series this Wednesday night, at 7pm. I'll be sitting down with three engaging locals: businesswoman Margaret Dunn, music shop owner Gordon O'Brien, and author Lisa Moore. We'll be sharing memories and stories about growing up in St. John's, and hope you will join us!